This Unique Black Diamond Spinning Band Ring makes a statement that you dare to be different. Here at Rafaello & Co. thats all that we are about, its our slogan, its what we live by. 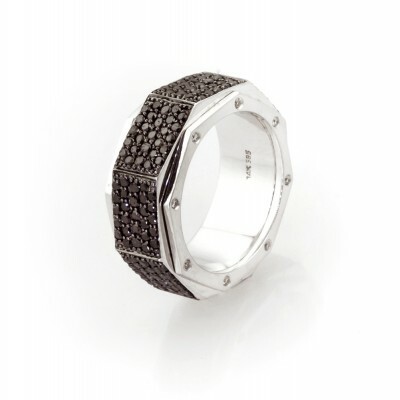 This Band is a two piece ring that is brought together so that the black diamond piece spins. The ring weighs approximately 13.4 Grams in 14K White and Black Gloss Gold. These AAA clarity black diamonds equmilating to 5.2 Carats are magnificent, set in a Pave’ setting.